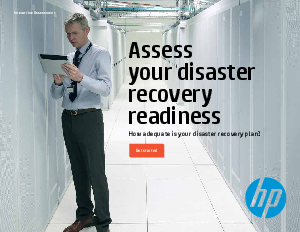 > HP > Asses Your Disaster Recovery Readiness: How Adequate is Your Disaster Recovery Plan? Asses Your Disaster Recovery Readiness: How Adequate is Your Disaster Recovery Plan? When was the last time you thought about your disaster recovery plan? Natural disasters, such as earthquakes, tsunamis, hurricanes, fires, or floods can occur anytime and disable your data center, with little to no warning. Hacker activities like a denial of service attack can also take down your systems unexpectedly. Then you have the more mundane risks such as human error and hardware or software failures. The only predictable thing to say about these risks is that at some point, on some scale, you’ll have to recover your data center from downtime. When it comes to disaster readiness, proactive planning is the key to success. Every business, regardless of size, needs to have a well-tested disaster recovery plan in place. Every minute your systems are down, the financial implications grow. Take the assessment to see where your disaster recovery plan ranks. Then learn about next steps and more information.